St Mark James cardiopulmonary resuscitation level “C” is considered the most in-depth and well-known cardiopulmonary resuscitation (CPR) “only” re-certification program. This program is made for candidates that have already been given a cardiopulmonary resuscitation C and AED award and need to recertify the certificate. AED training and re-certification is included with the training course. Students are not going to acquire any kind of first-aid certification with this cardiopulmonary resuscitation “only” lesson. Students must ensure they fulfill the essential requirements prior to registering for the course. The re-cert program is shorter and less costly when compared with the first course. To enroll for a cardiopulmonary resuscitation (CPR) C and AED re-certification class within Windsor scroll to the bottom of this page to find out the location and date selections offered. Upon completion from this re-certification program candidates will get a St Mark James cardiopulmonary resuscitation C cert that meets many different recognition requirements. This certification is valid for 3 years. The cardiopulmonary resuscitation C re-certification class costs — dollars and takes approximately 4 hours to finish. Windsor First Aid proudly offers the most affordable prices inside the Windsor region. Customers must have successfully done a CPR C program (or higher) in the previous 3 years. Customers must have successfully done the last training course via a credible St Mark James training provider. If you aren’t sure if your preceding award meets the prerequisites please call or email us. To register in a cardiopulmonary resuscitation (CPR) C and AED re-cert in Windsor find the class date and time from the selection below. Application can efficiently be achieved on-line. Space is limited so enroll now to guarantee a seat within the class. 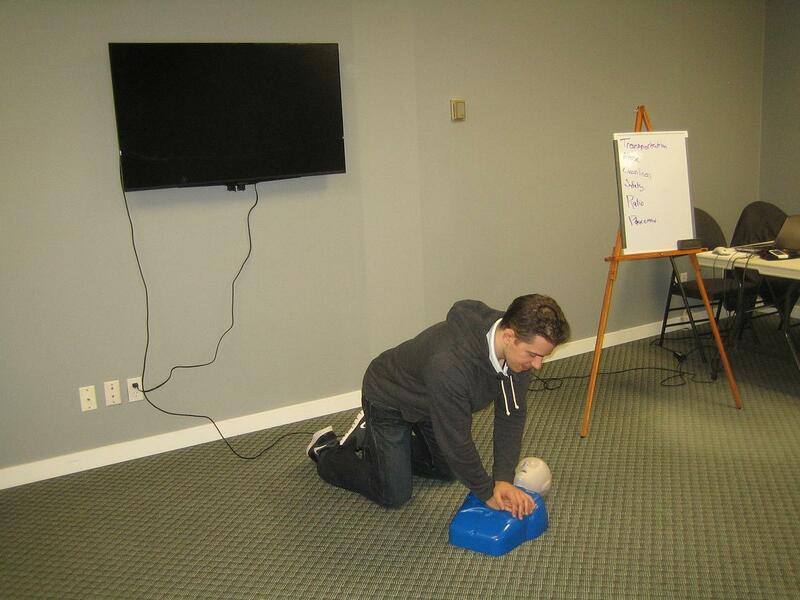 Windsor First Aid provides private cardiopulmonary resuscitation (CPR) “C” renewal programs. Let us know through electronic mail or phone in order to book and inquire about a private cardiopulmonary resuscitation (CPR) C and AED refresher training course.